Customizable gameplay; Lifelike ball physics; Brilliant pitcher/batter interface. Manager mode only online; Occasional AI quirks; Language barrier. 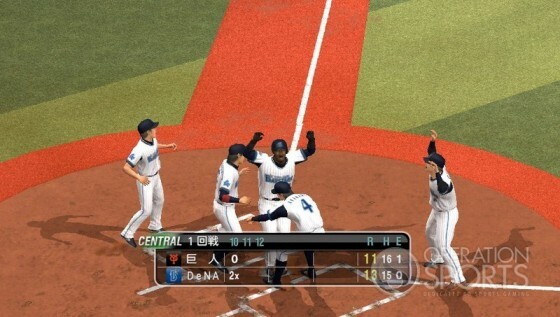 Pro Yakyū Spirits 2013 plays an amazingly realistic game of baseball. Konami hits another home run with a great baseball simulation. Portable baseball games are no longer minor league products. The Vita version of MLB 13: The Show already proved it, and now Konami's Pro Yakyū Spirits 2013 also proves it belongs in sports gaming's big leagues, showcasing the same all-star skill set as its PlayStation 3 brother, minus a thousand or so polygons and live online gameplay. If your memories of portable baseball gaming are Bo Jackson beeping around the base path on an LCD screen or Mario and friends running at a snail's pace through black in white fields, those visions will be obliterated the moment Pro Yakyū Spirits 2013 comes to life on the Vita's radiant 5-inch OLED display. Pro Yakyū Spirits 2013 is a faithful rendition of America's pastime, albeit, featuring teams with anime mascots and player names that most gamers cannot read, let alone pronounce. Do not be fooled by the foreign symbols and logos; Konami's Pro Yakyū Spirits 2013 is a baseball game as true and real as its Major League counterpart on the opposite end of the Pacific. Instead of a lazy afternoon at a Major League ballpark, games of Pro Yakyū Spirits 2013 more closely resemble an international soccer match, as the electric Japanese crowds chant, cheer and bang drums from the opening pitch until the final out. Playoff matchups generate an even wilder atmosphere, featuring special pre-game and post-game cutscenes plus heightened crowd intensity. Commentary in Pro Yakyū Spirits 2013 is equally exciting, with new play-by-play man Mitsuhashi delivering a high-energy performance in the broadcast booth. Two analysts, Komiyama and Nishi, have joined Pro Yakyū Spirits 2013's reworked announcing crew, though the analysts' lines appear infrequently, making Mitsuhashi the dominant voice of the game. Pro Yakyū Spirits 2013's frame rate holds close to 30 frames per seconds, with occasional dips below that mark when the ball is put in play. Load times are not noticeable while navigating the menus. However, between innings and during lineup changes, a solid black screen pops up, masking some relatively heavy loading and hurting Pro Yakyū Spirits 2013's otherwise-excellent immersion. Both day and night games are selectable, as well as different weather effects for sunny, overcast, light rain, normal rain and heavy rain. Season mode games can even be interrupted or suspended due to rain if the rain-out option is turned on. During close-up shots, Pro Yakyū Spirits 2013's crowds appear humorously low-resolution and pixelated, but this visual compromise allows the highly detailed ballparks to be full of moving fans while still maintaining high-quality faces and player models for the actual ballplayers. Pro Yakyū Spirits 2013's player models look amazingly lifelike during slow motion replays, which are accessed by holding down select immediately after a play completes. Pro Yakyū Spirits 2013's pitching and hitting animations are stunningly realistic, as are the multitude of diving, spinning and turning throws. Standard running animations, oddly, are what Pro Yakyū Spirits 2013 struggles with most. Fielders' forward momentum seems exaggerated, never looking or feeling quite right. Collision physics between players also appear off. Player models commonly clip through each other during tag-out animations or whenever two players cross paths. Animation variety is impressive, with literally hundreds of unique batter stances and swing styles. Pitchers, not to be left out, sport dozens of different grips, windups and deliveries. Several Major League Baseball players' signature animations have been sneakily included, making it possible to recreate many American ballplayers like Derek Jeter or CC Sabathia using Pro Yakyū Spirits 2013's extensive player creator. Along with the different windup and delivery animations, Pro Yakyū Spirits 2013 also includes over 50 unique pitch types, each with its own spin, arc and velocity. About 15 of the game's pitches are player-specific, meaning certain hurlers like Shun Yamaguchi from the Yokohama DeNA BayStars or Nagisa Arakaki of the Fukuoka SoftBank Hawks have signature throws that only they can use. 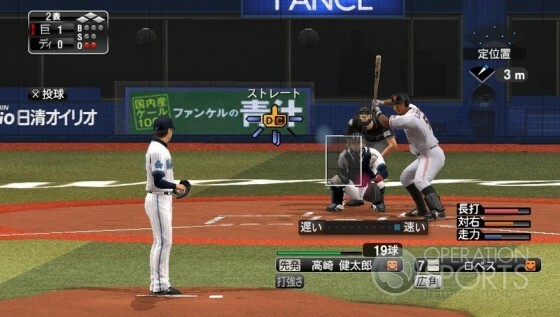 Hitting in Pro Yakyū Spirits 2013 is cursor-based, challenging the player to align a bat-shaped cursor over a ball-shaped pitching icon. Strike zones are divided into 9 rectangles, featuring player-specific hot, neutral or cold regions. Hot/cold zones are dynamic, meaning a player might begin an at-bat with two hot areas, only to see one of them disappear after falling behind in the count 0-2. Likewise, a pitcher who gets himself into a 2-0 hole might see a batter's initial cold zone go away or a new hot zone appear halfway through the plate appearance. During an at-bat, the size of the pitcher's ball cursor will vary each pitch depending on how well he times his release point. A poorly timed release will cause the ball cursor to balloon, making the pitch easier to hit. Alternatively, a well-timed release shrinks the ball cursor, making it much more difficult for the batter to target the pitch. The "sharpness" rating also affects each pitch's appearance to the batter, as every throw type in a hurler's arsenal is rated on a scale from "G" to "S" in sharpness. For pitches rated "D" and below, even a perfectly timed throw will still appear as a huge hitting target. Because each pitcher uses unique wind up and release animations, learning the different timing windows for each member of your pitching staff becomes a large part of the challenge to pitching well in Pro Yakyū Spirits 2013. Hitters have the option of swinging for contact, which yields the normal oblong batting cursor, or swinging for power, which diminishes the bat's sweet spot to a tiny circle in exchange for a huge increase to hitting power. Batters can swing using the X button to pull pitches or the O button to aim for the opposite field. Pull swings are best-used to defend the inside and middle portions of the plate, whereas push swings excel at punishing outside pitches. The timing differs for each button press, as a successful X swing must be started much earlier than an O swing. O button hacks, however, are much more forgiving, as the timing window for making contact is larger than it is during an X swing. The trade-off for riskier X button swings is that they provide superior hitting power. Though difficult, it is possible to hit home runs using the O button, just as it is doable, though much tougher, to homer with a contact swing. 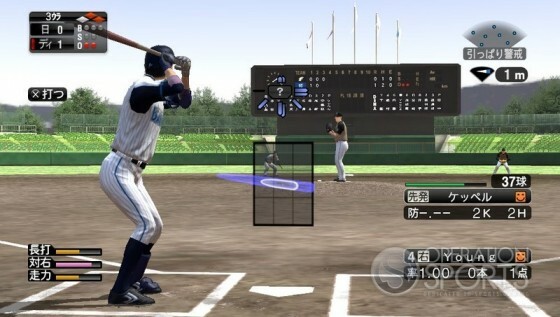 Pro Yakyū Spirits 2013's ball physics feel entirely natural, as hits always go where they should based on the contact point of the bat cursor. Gamers who struggle to line up swings can utilize varying degrees of batting assists, which will automatically correct aiming mistakes by nudging the bat's sweet spot closer to the pitch target. Likewise, gamers struggling with pitch release timing can turn on an assist that lessens the penalty for poorly released throws. Mutliple difficulty settings are available for the computer AI, as computer teams' pitching, hitting, fielding and baserunning skills can each be tweaked independently. Visual settings, too, feature a wealth of options that can be toggled on or off, as virtually every gameplay-related meter or indicator in the game's HUD can be toggled on or off. Difficulty and presentation customization are a huge boon for Pro Yakyū Spirits 2013, especially when compared to the limited options available in many American sports games. Instead of pinch-hitting for soon-to-be-replaced pitchers, the computer has a tendency to leave pitchers in to hit, then turn around the next half-inning and make a pitching change. 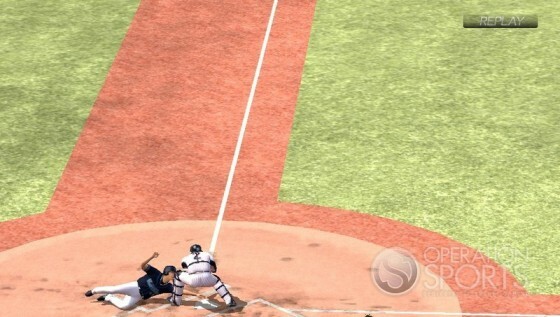 Even with A-rated or S-rated runners on base, the computer rarely attempts pickoffs, making it too easy to steal bases. These two issues, along with some occasional missteps in computer fielder pathing, are currently the only sore spots in Pro Yakyū Spirits 2013's otherwise-excellent AI. 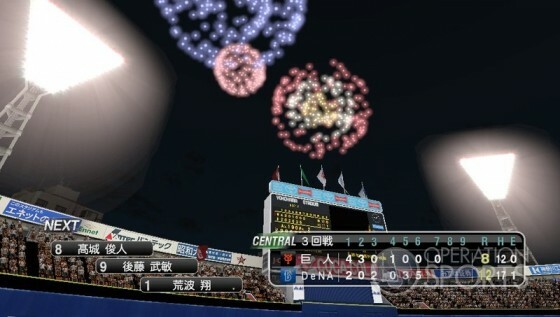 Unlike most American sports games, Pro Yakyū Spirits 2013's rating system utilizes the entire 99-point scale, as many players have individual ratings in the 20s and 30s. As there are only twelve teams to rate in Nippon Professional Baseball, developer Konami is very thorough in their individual player ratings. So just because a fielder has great throwing strength, doesn't automatically mean he is going to have top throwing accuracy or vice versa. In addition to their eight skill ratings, fielders are assigned a letter grade ("G" is the worst, "S" is the best) for each position they are capable of playing. The letter grades represent a player's reaction time and range while playing that particular position. So a natural third baseman might have a "B" grade in his regular spot, which would help him react quickly to line drives, but that letter rating could drop down to a "D" if he is subbed in at shortstop, where he would then have difficulty reacting to hard hits. Many players also have special abilities that help or hinder their on-field performance. Of the game's 90-plus abilities, some are extremely powerful, such as "Autumn Man," which gives the player a good to great condition rating for the entirety of August, September and October. Most abilities, however, only apply to special situations, like the "Block" and "Tackle" powers, which come into play only during home plate collisions. In season mode, abilities become dynamic, meaning players will gain new abilities or lose existing ones based on each game's result. Player condition, fatigue and injury also affect a team's performance throughout a season. Pro Yakyū Spirits 2013's condition rating acts much like "form" in soccer games, creating a positive, negative or neutral modifier to players' existing skill ratings. 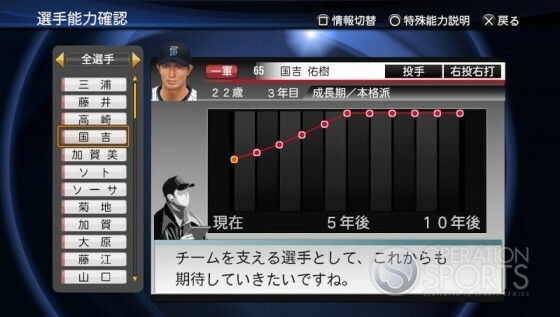 Condition allows Pro Yakyū Spirits 2013's season mode to mirror the many slumps and hot streaks that occur throughout a year of baseball. Fatigue increases on a player-by-player basis over the course of a season based on how much each player hits, pitches, fields and runs the bases. Naturally, a designated hitter who only hits and never fields will fatigue at a much slower rate than a shortstop who steals lots of bases and has to reach and dive all over the infield every game. Players with an "S" or "A" fatigue recovery rating can handle playing most, if not all of a full season. Older or injury-prone players with a "D" or "E" fatigue recovery rating will require regular days off throughout the year to stay fresh. Teams in Pro Yakyū Spirits 2013 also tire faster and recover slower during road trips, whereas home stands use up less energy and allow the team to rejuvenate quicker. It is currently unknown whether or not high fatigue diminishes a player's in-game performance, but at minimum, it dramatically increases the likelihood of getting hurt during a game. For fielders, in-game injuries can potentially occur during slides, dives, collisions or being hit by a pitch. Pitchers tend to get injured when struck by line drives or when they are left in the game too long and continue to pitch through heavy fatigue. Since there is no disabled list in Pro Yakyū Spirits 2013, injured players need to be sent down to the minor leagues for a minimum of 10 games to heal quickly. Managers can choose to leave a hurt player on the team's main roster, but he will heal much slower than if he had been sent down to the minors. Most injuries are debilitating, but others, called "nagging injuries," can be played through. The player's effectiveness, however, is severely diminished by a lowered condition rating, plus the player risks obtaining a more serious, multi-month or season-ending injury. Nagging injuries can occur without warning and without any on-field incident if a player has the "injury prevent down" ability. Newcomers should begin their Pro Yakyū Spirits 2013 career by completing the excellent tutorial, which teaches all four components of the game -- pitching, hitting, fielding and base running -- through instructional mini games. Gamers unfamiliar with Nippon Professional Baseball may next want to try out each of the twelve NPB teams in Exhibition mode to get a feel for the league's unique selection of players and stadiums. Along with all the official Nippon Professional Baseball team stadiums, another four ball parks can be unlocked for free by using VP points at the in-game store. Simulation purists can choose to control just the manager, providing play-by-play strategy and instruction to a computer-controlled team. For players who want to sim games but don't want to micromanage each individual at-bat, full game simulations can also be done in a matter of seconds from the main Pennant Race menu. 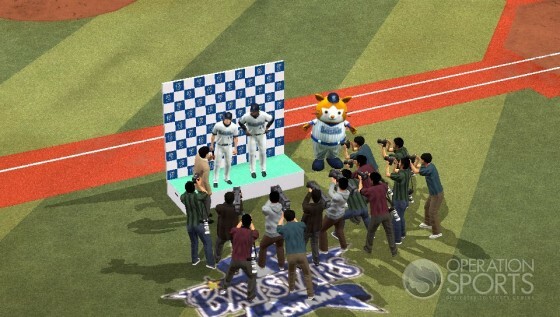 For a more hands-on Pennant Race experience, gamers can play an entire 20-year career controlling a single person, be it an existing Nippon Professional Baseball player, a fictional created player or one of the game's unlockable Nippon Professional Baseball legends. 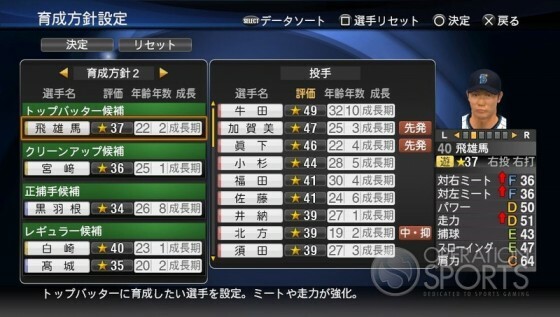 In a unique twist, some gameplay is involved when creating a new player in Pro Yakyū Spirits 2013, as your on-field performance during a multi-round "gameplay test" will determine your created player's initial ratings and abilities. Created players then earn extra abilities and small ratings boosts over time based on career performance. The third and most traditional way of playing Pennant Race is by simply controlling every player on the team, just as the majority of baseball video games have done for decades. Numerous team management options are available in the downtime between games. Aside from day-to-day lineup and position management, gamers can also set long-term team goals by choosing individual training drills for their players. By default, the computer will automatically assign individual training regimens to each of the team's players, but if desired, there is the option to manually designate training. A small number of "future starters" can also be picked out from the team's roster to provide an extra training boost for younger players who show exceptional potential. Instead of offering a traditional free agent pool during the season, Pro Yakyū Spirits 2013 allows teams to search for foreign players, who, after a few weeks of waiting, can eventually be brought into the league. Foreign players typically excel at one or two skills while being weak in most other categories. For example, you might find a foreigner whose "A" hitting power is offset by an "E" in fielding, a "G" in baserunning and an "F" at contact hitting. When searching for foreign players, teams can only specify their desired position and handedness, so finding a player of need is purely luck-based. Managers can also make trades to further improve their team's roster. Trade requests are fairly simple to send, though actually reaching an agreement with the stingy computer AI can be tough. Even if you aren't actively offering trades throughout the season, the computer-controlled clubs will still send trade requests directly to your front office, which will pop-up on screen infrequently and must either be accepted or denied on the spot. Pro Yakyū Spirits 2013's career progression system organizes ballplayers into three separate categories: developing players (teens to mid-20s), prime players (late-20s to early-30s) and declining player (mid-30s and beyond). After each game played, developing players will earn around two to four experience points, while declining players lose around ten to fourteen XP. Typically, prime players will neither progress nor regress after a game, as their ratings are largely stable, only wavering a single point at most. Note that experience points are different from a player's individual skill ratings, as it takes about 1,000 experience points for a player to level up from a D to C rating in a single skill like hitting power, which would increase that skill's numeric rating from 50 to 60. The off-season in Pro Yakyū Spirits 2013 consists of a rookie draft followed by a free agent signing period. Both foreign and domestic players can be signed during free agency. The preaseason is an advantageous time to sign foreigners, as here they will appear on the roster instantly, whereas there's typically a waiting period of several weeks to find a foreigner mid-season. Domestic players cannot even be signed at all once the games start back up, which creates a brief but fierce bidding war for the few days that the top Japanese players are available. Once all draft picks and free agents are signed, every team receives a small amount of experience points to simulate the affects of "spring training" on all the league's players. Whenever there's not enough time to play a full game or deal with the litany of responsibilities in season mode, Homerun Race and Training mode both offer fun ways to test out the physical limits of your favorite players or work on your hitting technique. While training mode is helpful for learning the different timings required for pull swings (X button) and push swings (O button), taking practice cuts in Pro Yakyū Spirits 2013 is visually unsatisfying, as the camera does not follow the ball after contact; instead, it simply gives a text readout of how far the hit went and whether or not it was an out. Training mode at least allows gamers to work on hitting troublesome pitch types, as a filter lets gamers face as many or as few pitch types as they like. Homerun Race is a standard derby mode, where the batter chooses a round of either 10 pitches or 20 pitches, then aims to hit as many home runs as possible. Unfortunately, online leaderboards are not supported for Homerun Race, but chasing personal records remains fun, and the Vita's screenshot feature -- accessed by pressing "start" and the "PlayStation" button simultaneously -- allows braggarts to create a visual record of their legendary long balls. Another quick time-waster is the Pro Baseball Link quiz mode, which awards in-game currency (Link Points) for correctly answering daily trivia questions or successfully predicting the outcome of weekly Nippon Professional Baseball games. Link Points can be redeemed for mode-specific performance boosters, which function much like EA Sports' Dynasty Accelerators. 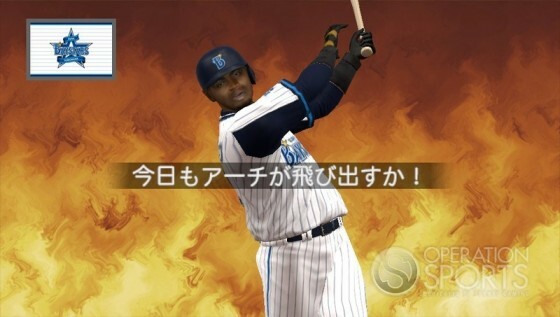 Like EA Sports' Ultimate Team feature, Pro Yakyū Spirits 2013's Grand Prix mode challenges gamers to collect cards of Nippon Professional Baseball players and assemble a fantasy team to compete in fictional tournaments. Grand Prix's gameplay style defaults to manager mode, where the user-controlled manager gives play-by-play instructions to his computer-controlled team. However, the more traditional "team play" game style -- where the user controls every player on the field manually -- can be unlocked by purchasing item number ten on page one of the VP store. While online play is available in Pro Yakyū Spirits 2013, it is limited to manager mode only, which means gamers will need to purchase the PlayStation 3 version if they want to actually play against live opponents instead of simply coaching against them. 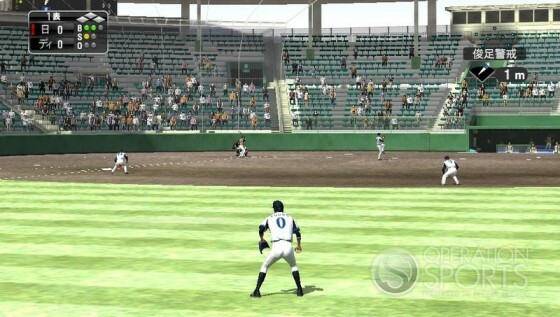 The other two exclusive PlayStation 3 features are post-game video highlights and a broadcast style camera angle for fielding and baserunning. 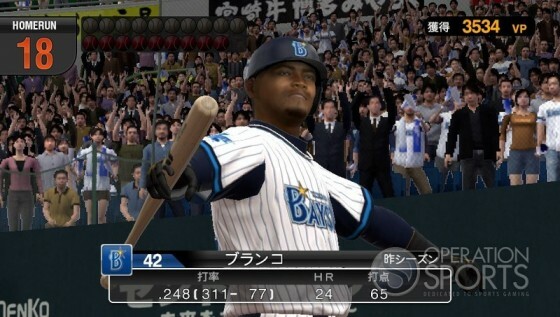 Star Player is another mode that uses unique camera angles, as this story-driven single-player experience focuses on the career arc of one person, be it a created player, a current Nippon Professional Baseball player or an NPB legend. Both pitcher and fielder careers are available in Star Player, though the over-the-shoulder camera angle used for fielding and baserunning can be disorienting. In addition to simply playing well, completing specific in-game goals and reaching career milestones will earn bonus experience points, which can then be used to upgrade a player's attributes and purchase new abilities. There is one last game mode called Management that I am unable to review properly because it is an entirely text-based story mode. There is no actual gameplay to Management mode, as it's focus is on building a staff, controlling team finances and maintaining player morale. It's also worth noting that mid-game saves are supported across all modes in Pro Yakyū Spirits 2013, with the caveat that only one mid-game save can be stored at a time. For normal saves, up to 20 unique save files are allowed for each individual mode. Believable ball physics, intricate attribute/ability systems and intense pitcher/batter duels make Pro Yakyū Spirits 2013 easily worth the $70 import price, even if Exhibition mode is all you decide to play. Learning your way around the multi-season franchise modes is as simple as following a few screen-by-screen translation guides, making it possible to manage all aspects of your Japanese team without any previous knowledge of the language. 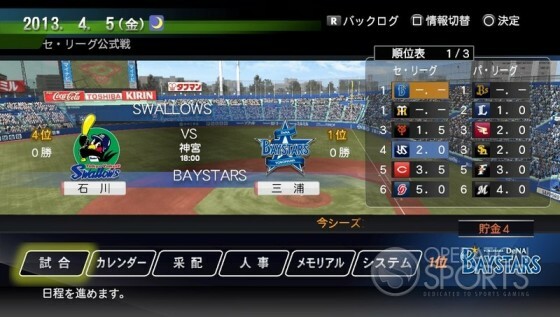 Foreign text should not keep anyone from enjoying Konami's latest superstar baseball simulation, and neither will Sony's video game systems, which remain region free and fully capable of playing a Japanese copy of Pro Yakyū Spirits 2013 on an American PlayStation 3 or PlayStation Vita without issue. Audio: The new three-person commentary team is highlighted by a main announcer who resembles a Japanese Chris Berman with his lively, over-the-top calls. Passionate crowds add to the on-field clamor by banging drums, singing team songs and reciting group chants. The catchy instrumental soundtrack features an eclectic mix of rock, jazz and techno, scoring major bonus points for some superb saxophone playing. You can never have enough saxophone. Visuals: While the Vita version obviously displays a lower resolution, features less-detailed textures and lacks the anti-aliasing of its PlayStation 3 brother, watching Pro Yakyū Spirits 2013 come to life on the Vita's widescreen OLED display is an impressive visual experience. Control Scheme: The Vita's bite-size analog nub initially makes aiming swings and pitches more difficult than it would be using a full-size PlayStation controller. Thankfully, Pro Yakyū Spirits 2013 features numerous assists and cursor sensitivity levels that, when tweaked properly, create a comfortable level of control. However, the ergonomics of holding the fairly heavy and slightly awkward Vita system for extended periods of time can cause hand and arm cramps. Learning Curve: Pro Yakyū Spirits 2013 is a difficult game to learn, not just because of the language barrier, but also because of its complex attribute- and ability-driven gameplay. Bookmarking spiritstranslation.com is essential, and keeping a laptop or smartphone open for reference during play will aid non-Japanese speakers in solving the game's mysteries. 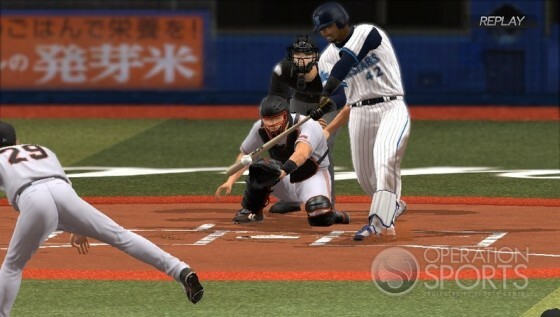 Lasting Value: With a maximum length of 20 seasons, the expansive Pennant Race and Star Player modes will keep Pro Yakyū Spirits 2013 loaded in baseball fans' Vitas all summer long. Nice, thorough review Jason! Anyone bummed out by the lack of quality Vita games really needs this game, along with Power Pro 2012 for Vita (our guides for that can be found at powerprotranslation.com). Learning to play the game does take some effort but it's not really a big deal. You just pick things up a little at a time and before you know it everything becomes second nature. It's been proven in the baseball/other forum here that most who try it want to put forth the effort to learn more because it's a great game. Very cool stuff. The pull swings , oppo swings , size of ball. Very nice review, couldn't agree more. The Japanese Power Pro game for the Vita is great as well! Nice seeing the game gain some traction. Thank you jyoung for taking the time to learn the game and sharing its wonderfulness! wish the MLB in general could have more of the Japnesee atmosphere. so is it better than The Show 13? If the MLB license is no longer 2K Sports/1st party publisher exclusive, then I would love to see Konami put out an MLB game here in the states. Could you imagine the possibilities stemming from a quality competition between this and The Show?! Yep. PYS Vita plays superbly and looks and sounds much better. The hitting mechanic at the heart of the game is pure fun and far ahead of any other contemporary baseball title. It's intuitive, satisfying and transparent. The criteria the player must meet to get a hit, bunt or homerun are laid out in front of you. You will always know why the ball did what it did because of the physics, player abilities and ultimately your own skill with the controls. That can't really be said of The Show where there's a nagging doubt of something deciding success and failure on a random basis. If you've ever been frustrated with The Show's hitting, had trouble reading pitches, wondered why that wheelhouse perfectly timed slug didn't go out of the park or been bogged down in endless slider tweaking, then PYS is really worth checking out. Great to see a review on the front page. Now only if we had a Japanese Basketball game on the Vita..
WELP, I just imported this. See how long it takes to get here. Turns out.. I ordered 2012 and not 2013... How much different are the two?